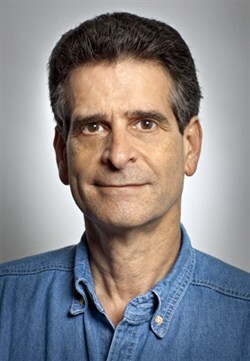 Very few people know who Dean Kamen is. He is someone who should be considered on a par with Bill Gates, Steve Jobs and the other great geniuses of our time. On the other hand, thousands of clients use his inventions every day: the Segway; home dialysis machines; automatic syringes that administer insulin; a water treatment system that transforms any type of water into drinking water and that could change the world; an all-surface wheelchair that can help people with reduced mobility to stand up… and a long etcetera of innovations that have changed the lives of many people with the help of his company: DEKA. As a child, he asked himself why a ball bounced lower each time it bounced and why a hot drink cools if you leave it on a table, while a cold drink tends to heat up. Now, 64 years later, he walks around his mansion in Bedford, New Hampshire, on the outskirts of Manchester, and goes to work every day, piloting his own helicopter. It is a dream that he had always had, ever since he was a child. His house contains a corridor in which there are six paintings made by his father; they are portraits of Archimedes, Da Vinci, Galileo, Newton, Maxwell and Einstein. According to Dean Kamen, these are the greatest names in the history of science. Dean Kamen always says that the idea is everything; everything else are just accessories. Without a doubt, there are many other potential Dean Kamens in the world; they have the idea, but they lack the means to develop the prototype, the knowledge of mechanics, or the technical know-how. But this is where we come in. If you have an idea in your head for a machine that you think could change the world, come and see us and we will develop it together. From the initial idea, via the design for the prototype, to the final product and its production. We will provide you with a specialised engineering team that can turn your idea into a solution for thousands of people.